It was in the 15th century that the "Art and culture in Benin" reached its peak. This was prompted by the arrival of Portuguese that resulted to trading relations between the Europeans and the Benin. The influence of the Portuguese can be seen from the artwork from that time. Fabrics express the traditional art largely. For instance, in the Southern Benin, woven fabrics are a common sight; though it is in Northern Benin that you find high quality woven items. This is as result of high-grade thread from Burkina Faso used in the North. The artwork in Benin includes a range of religious objects, masks, animal heads, busts, figurines and other artifacts. These illustrate cultural events and religious themes. They narrate events and achievements which occurred then and were central to their livelihoods and beliefs. Today one of the most common artifacts is the ivory mask, which is based on Queen Idia. It is commonly known as Festac mask. Ikegobo is another unique object to Benin Art. 1. The artist moulds his work in wax. This provides an outlet for melted metal. 2. He covers the wax core with powdered clay to cling tightly inside every depression. 3. He then applies heat; this drain wax off the mould. 4. He puts the metal inside a crucible, carefully sealing with clay. 5. Everything is put over open fire flames, the crucible at the bottom. 6. As the metal begins to melt, he turns the mould over with a pair of priers. 7. Melted bronze runs out into the hollow made by the wax. 8. The mould is broken when the metal cools. 9. The rough edges are made even using a chisel. 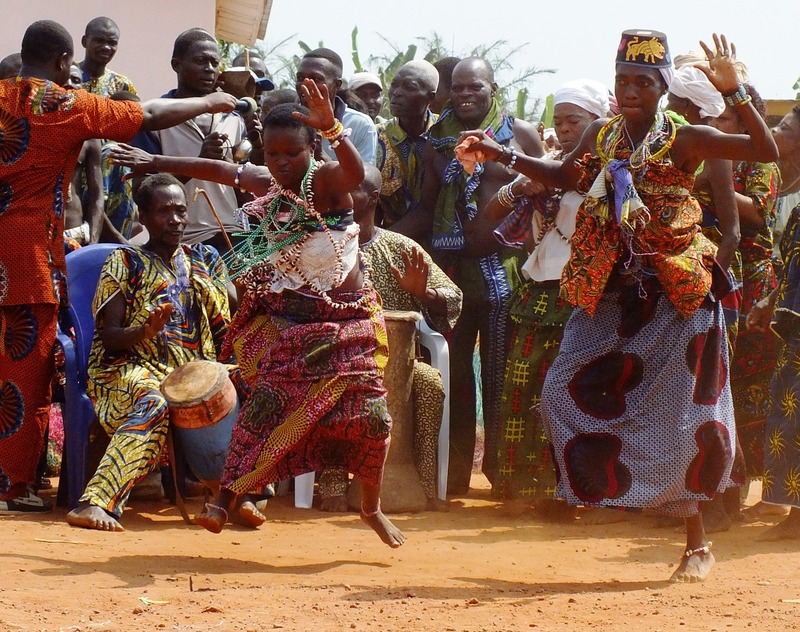 Benin culture is diverse making it an appealing feature in the country. The population in Benin is made up of over twenty sociocultural segments, each with different history, customs and language. Among the various groups friendship and hospitality is a common value. The Beninese are open minded and welcome strangers in warmth hence it is easy to engage in a conversation resulting in much information gain about "Art and Culture in Benin". In the south, Fon and the Yoruba are the main sociocultural groups. Fon forms the dominant language though there are a lot of many more dialects such as Gun, Tori, Seto and Ayizo. In the North, the prominent cultural groups are the Dendi, the Bariba and the Betamaribe or Somba. The most significant and largest Bariba event is the Ganni festival held annually and is celebrated at Nikki. The Fulani, also called Pulah, are scattered throughout Northern Benin. Spiritual values are highly valued in Benin. The traditional Animism coexist together with Christianity (Protestant, Catholic and Evangelist) and Islam.